Speaking today, he also cast doubt on whether the exact nature of water charges will be known in the coming weeks. TÁNAISTE EAMON GILMORE had refused to be drawn on whether an independent inquiry is needed into bugging at the Garda Síochána Ombudsman Commission (GSOC). 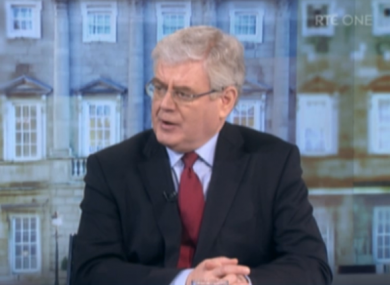 Speaking to RTÉ’s The Week in Politics, the Tánaiste said that current process is sufficient, highlighting that is passing through Oireachtas committees. “It’s called accountability,” he said. However, he noted that the Minister for Justice Alan Shatter is due to appear before a committee next week to discuss the matter, and that further developments could take place after this meeting. Speaking to the same programme, Fianna Fáil’s Justice Spokesperson Niall Collins that an independent investigation is needed to “allay the public fears”. “What we need to do is get the bodies together, find out exactly the timeline of events,” he said, “We also need to find out from the minister why he wasn’t fortchoming to the Dail in terms of the information he had at his disposal. That’s a very serious matter also. Sinn Fein’s Aengus Ó Snodaigh noted that a commission of inquiry would be able to discovered much more than Oireachtas committees. In the wide-ranging interview, Gilmore also said that he ‘doesn’t know’ if water charges will be finialised before St Patrick’s Day, as previously suggested by Minister for the Environment Phil Hogan. He reiterated that the government is looking for metered charges, and that charges will apply after a free household allowance. “It’s important that we get it right”, he said, defending the potential of delays in the announcement. The Tánaiste also confirmed that a cabinet reshuffle could take place later this year — but that younger TDs might not move up the ranks. “I don’t think age comes into it,” he said, stressing that it should be more about capability and experience. Email “"It's called accountability": Tánaiste defends course of GSOC bugging controversy”. Feedback on “"It's called accountability": Tánaiste defends course of GSOC bugging controversy”.